Today I’m making final lists for tomorrow’s shopping extravaganza with Pratapana, (pictured above, left, with ever-shiny shaved head). 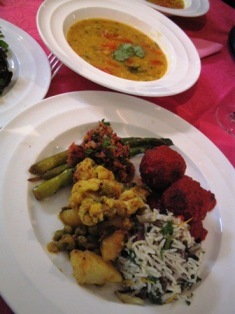 This picture was taken over dinner at the grand finale of one of our recent Govinda’s Cookery Classes. 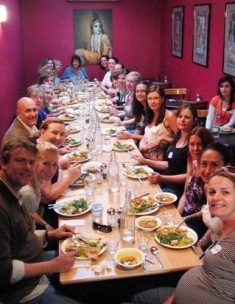 Pratapana maître d’s and manages that fine restaurant in inner-Sydney’s Darlinghurst, and facilitates many events there including the Movie Room, Kirtan Nights, Yoga, Concerts, Ayurveda and Bhakti Yoga Workshops. He’s a busy man. Despite the fact that this Saturday’s class falls on day #1 of the Beijing Olympic events, we have some of our heaviest bookings ever. I’ll have my camera with me again and will try to share some of the best moments with you.